To organise any community event takes lots of effort and a huge amount of passion. Imagine then how a small band of film lovers living in and around Gympie banded together to create a world-class film festival, not just for one year… but for 7 years in a row! 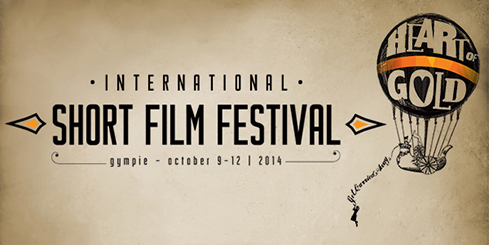 I am of course talking about the Heart of Gold International Short Film Festival. From October 9th to 12th the Heart of Gold festival will once again bring to the screens of the northern Sunshine Coast Hinterland the very best of Australian and International short films. You will laugh, you will cry yet most of all you will marvel at the talent behind the scripts, production and imagery of the films that make it into this year’s program. It is also a great opportunity to discover the charm and warmth of Gympie as the locals open the arms to welcome film makers and buffs alike from across Australia and indeed the world to their town. “It is such an honour for me to be asked to become the patron of 7th Annual Heart Of Gold International Short Film Festival, in Gympie, Queensland. I come from a regional area in New South Wales and I know even before the Festival begins in October, what a warm welcome people can expect from the people of Gympie and its surrounds. Gympie’s festival sits high on the list of the ever-growing popularity of regional film festivals throughout Australia and abroad. Its programme is always first class and offers a range of local and international short films with such a diverse variety that there is always something for everyone! It really is a “feel good” festival. I will be attending the festival in October and look forward to being part of some filmmaking workshops with the chance of meeting both visitors and filmmakers alike. The festivals support from within the Australian film community extends further in attracting judges of the likes of Peter and Michael Spierig, Tina Bursill, Holly Pitman and Victoria Thaine. Each year this festival has grown in depth and recognition and continues to demonstrate that as long as there is passion there is hope for making things happen. It truly reflects the determination that filmmakers young and old apply in their quest to have their stories told. Do yourself a big favor and log onto the festival’s website to discover their program of screening. There’s also a load of information on where to stay eat and generally have a great time whilst in Gympie for the festival. Little known, much loved… Mudjimba. Glasshouse Country Festival, it’s on now!